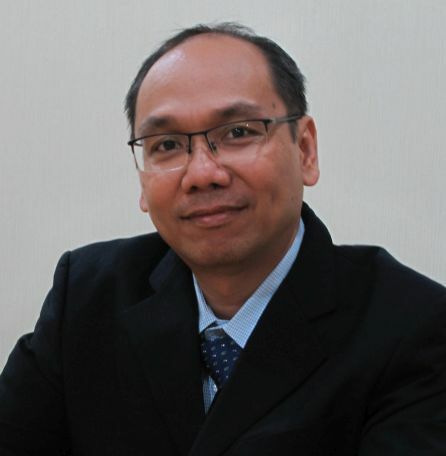 Dr. Nyoman Suwartha, S.T., M.T., M.Agr. Water supply, sanitation, and proper management of the environment and natural resources for the sustainability and prosperity of Indonesia are two national and strategic issues. Failure or success of its handling will determine the health status of the people in the present and future. The failure and success of the handling is the responsibility of all components of the nation including universities. This paradigm underlies the establishment of Environmental Engineering Study Program (EESP) at Faculty of Engineering, Universitas Indonesia. Protection of environment in either local or global scope from any destruction/damage potentials in natural and anthropogenic activities. The forerunner of Environmental Engineering at Universitas Indonesia is a specialization of Sanitary Engineering which is one of five specializations in Civil Engineering Bachelor Program, Department of Civil Engineering, Faculty of Engineering. As there is significant interest of Civil Engineering Bachelor students in Sanitary Engineering and also the increase of environmental issues in Indonesia, Environmental Engineering Bachelor Program was opened in 2006 under the authorization of DIKTI with number 16/D/T/2006 in January 3, 2006 with accreditation A from BAN-PT (0554/SK/BAN-PT/Ak-SURV/S/II/2017). Moreover, Civil Engineering Study Program, PSTL is currently preparing the AUN QA (ASEAN University Network Quality Assurance) assessment for 2018. EESP Universitas Indonesia is part of the Department of Civil Engineering, which has two study programs, namely Civil Engineering Study Program (Regular, Parallel, International) and Environmental Engineering (Regular). 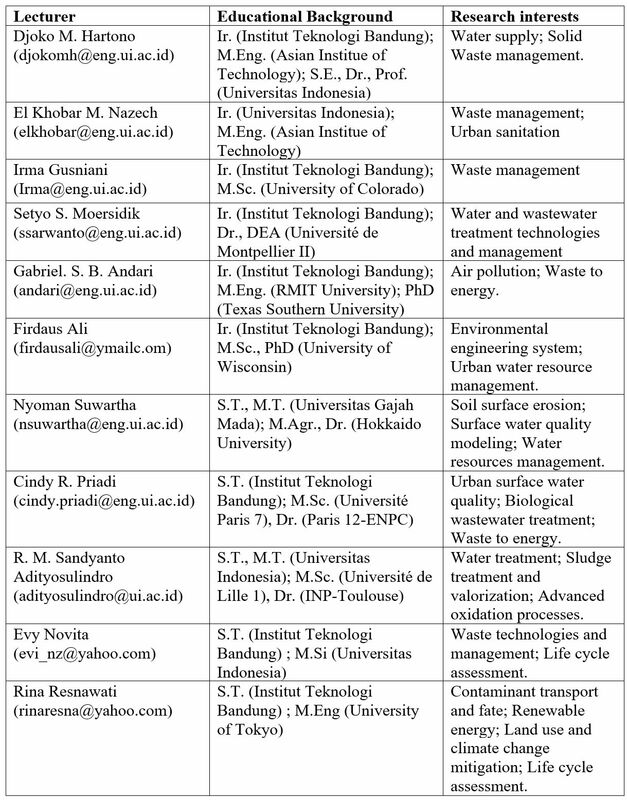 The student admission of Environmental Engineering follows the requirements set by Universitas Indonesia. Since the government regulations allow public university (PTN) to conduct self-admission exams, then UI held 3 type of student admission such as SNMPTN (National Admission selection for State University); SBMPTN (Collaborative Admission Test for State University) and SIMAK UI (Local University Admission Test). The details about the student admission can be found on the website http://simak.ui.ac.id. Briefly, the student admission for Environmental Engineering of Universitas Indonesia is done in 2 ways; student admission with and without entrance exam. The bachelor degree of Environmental Engineering accepts students for regular program only. Non entry test student admission is the entry selection based on the value of report cards. The acceptance is based on academic achievement indicated by the value of report cards, the school’s achievement index, and the capacity. SNMPTN is designated for students who will graduate in the same year as they registered. For example, PPKB 2015 is for High School students who will also graduate in 2015. SNMPTN is an invitation path for the student admission of the bachelor regular program. Although SNMPTN is an invitation path, it does not mean that UI sends an invitation to school. Instead, the SNMPTN national committee announces to schools to fill in student data on the PDSS website so students can enrol for SNMPTN student admission. Applicants may choose several educational programs available at various universities in Indonesia. Students who can’t participate in SNMPTN still have the opportunity to apply the bachelor regular program through SBMPTN. Anyone can participate in written test for student admissions without graduation year limitation but must follow the provisions of each educational program. SBMPTN is a written test for national student admission which is organized by the SBMPTN national committee. The test is intended for bachelor regular program. The maximum limit of the graduate year is 3 years, for example: student admission through SBMPTN 2015 made for high school (or equivalent) students who graduated in 2013, 2014, and 2015. Applicants can choose some existing programs in various universities in Indonesia. For further information, please visit SBMPTN official website (https://sbmptn.ac.id/). SIMAK is independent student admission tests organized by UI. This admission test designated to Bachelor Regular Program, Bachelor Parallel Program, and Vocational Program. The graduation year limit applies to the Registrant for Bachelor Regular Program. However, there is no limit of the graduation year for Parallel and Vocational Program. Applicants may choose several study programs and major on Regular, Parallel and Vocational simultaneously in one exam. The admission scheme does not affect the tuition fee. The tuition fee is determined by the education programs. Generally, the difference between the program is the entry tuition fee. Regular Program freed with the entry tuition fee and on the other hand Parallel Program charged with the entry tuition fee. 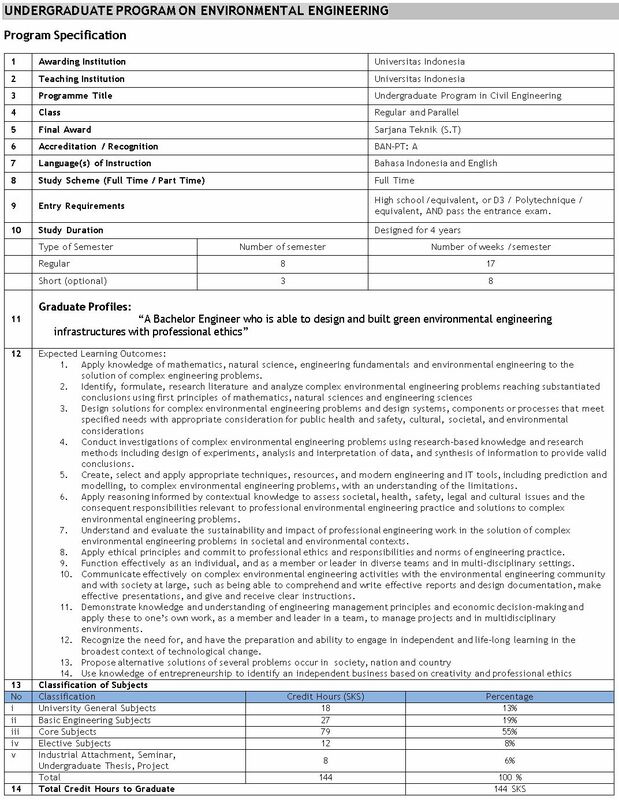 However, the Environmental Engineering Study Program only accept Regular Program. Since 2004, Universitas Indonesia has waived the entry tuition fee for the new student of Regular S1 Program as UI’s policy to allocate the cost of entry tuition fee from BOPTN (Operational Aid for State Higher Education) funds obtained from the Ministry of Education and Culture of Indonesia. In academic year 2015/2016, all new students of Regular S1 program will be charged only Biaya Operasional Pendidikan Berkeadilan (BOP-B) paid per semester based on the ability of the parent of student as responsible person. Educational Sector — ranging from continuing citizen and professional education provided by community colleges to graduate instruction provided by research universities. Public Service — ranging from operational management of water, wastewater or solid waste utilities at the city or regional level to administration of environmental regulations at the state and federal level, to environmental research. Industry —manufacturing, construction, and energy industrial sectors which have responsibility for treatment facility operation and minor design. Consulting Engineering Service — as facility design and can be expanded to include more emphasis on Brownfield investigations, pollut¬ant transport, regulatory guidance, sustainability, and facility operation. To form an appropriate graduate profile, the 2016 EESP Curriculum is referred to documents issued by the International Engineering Alliance (IEA) which incorporates 3 constituent agreements comprising the Washington Accord, Sydney Accord and Dublin Accord. The International Professional Engineering Agreement in Washington Accord used as a reference in the development of engineering education curriculum in the world. 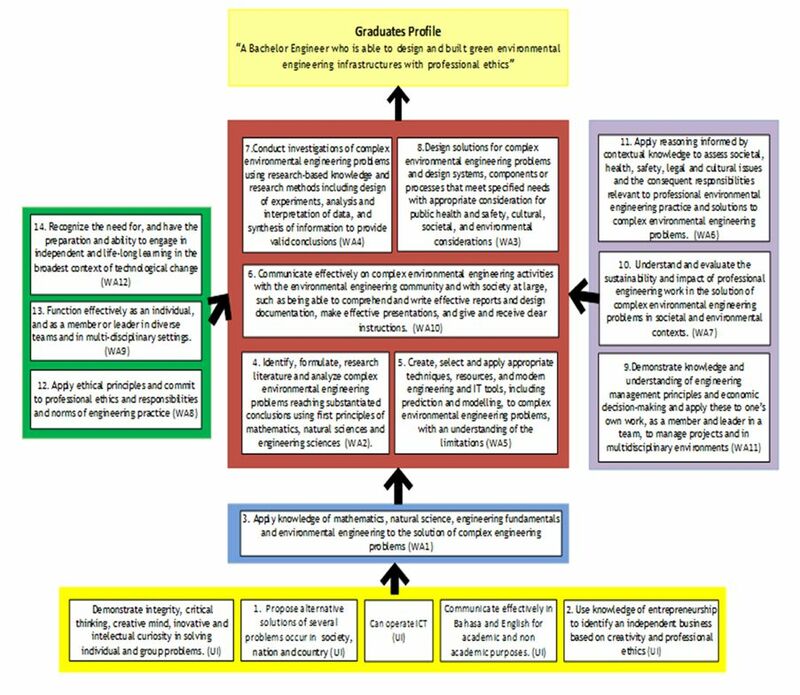 Based on Washington Accord (WA) there are 12 graduates’ attributes (competencies) that must be achieved. 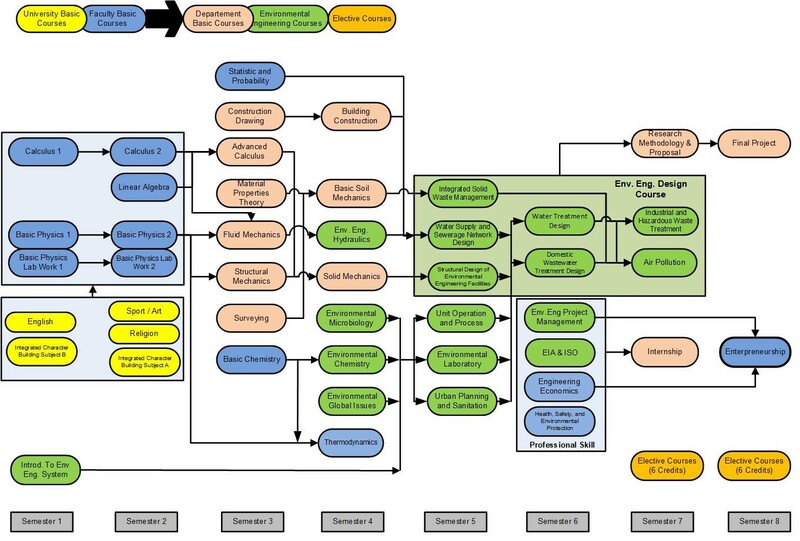 Competencies issued by the Washington Accord commonly applied in undergraduate engineering program, specifically the competence for Environmental Engineering also refers to documents issued by the American Society of Civil Engineering (ASCE) in 2009 and the American Academy of Environmental Engineering (AAEE) in the year 2008. In addition, the competence has also been adjusted to the Indonesian National Qualification Framework (KKNI). The admission for 2016 Curriculum starts from 2016/2017 Semester. After 2016 Curriculum admission, only modules included in this curriculum that will open for lecture, therefore a-year-period transition is enacted (during Sept 2016 to July 2017). During this transition, lectures from 2016 curriculum modules can open if there is any certain requirement/urgency in the 1st or 2nd semester of this one-year transition period. Students who have not passed any compulsory modules in 2012 Curriculum can take the same or equivalent lectures in Curriculum 2016. Equivalency for modules can be seen at Curriculum 2016 – 2012 Equivalency Table. If there is a discrepancy/difference in credit amount in the transition, the allowed credit amount considered for graduation is the credit when module is being taken. The minimum credit required to graduate from undergraduate program is 114 credits. In 2016 curriculum, the modules composition should be 132 credits for compulsory modules and 12 credits for optional modules. Dr. Cindy R. Priadi, S.T., M.Sc. Dr. R. M. Sandyanto Adityosulindro, S.T., M.T., M.Sc. Evy Novita Z., S.T., M.Si. Environmental Engineering Study Program (EESP) has laboratories to support the process of education and research. It can facilitate some laboratory activities such as water quality analysis (physical, chemical, and microbiological), waste characteristic and composition analysis, and air quality analysis. Furthermore, the laboratory also provides services to the community. Several courses in EESP which related to the field of Environmental Engineering are also supported by practical activities in order to provide motoric skills to students. In the laboratory, students are expected to be able to conduct water quality, air quality, solid waste characteristics, and microbiological analysis, as well as applying the principle of operation and process in water and wastewater treatment units in laboratory scale. Students can also use laboratory facilities to conduct research for competition and final project. This unit is used to identify, examine the microorganism growth, and to enumerated microorganisms in water, solid, and air. The unit provides some tools such as Hirayama-Autoclave, Memmert IN 30 Incubator, DNP-9052 Electro thermal Incubator IKA KS 260 Shaker, Vortex Mixer VM-300, desikator, transfer box, 80-2B Sentrifugator, Faser TWO 30-Laminar Air Flow, mikroskrop listrik (Olympus), and others. This unit is used to check the parameters of water and wastewater quality, as well as to check the characteristics of solids. Example of analytical tools in this unit are Spectophotometer 2000, Atomic Absorption Spechtrophotometer (AAS) with flame, and VELP-jar test. This unit examines specifically about solid waste treatment. The reactors in this unit are used to investigate solid waste treatment especially in landfills. Lysimeter with a capacity of 110 L, an anaerobic reactor with a diameter of 20 cm, and an anaerobic reactor with a diameter of 10 cm equipped with motor and stirrer are available.